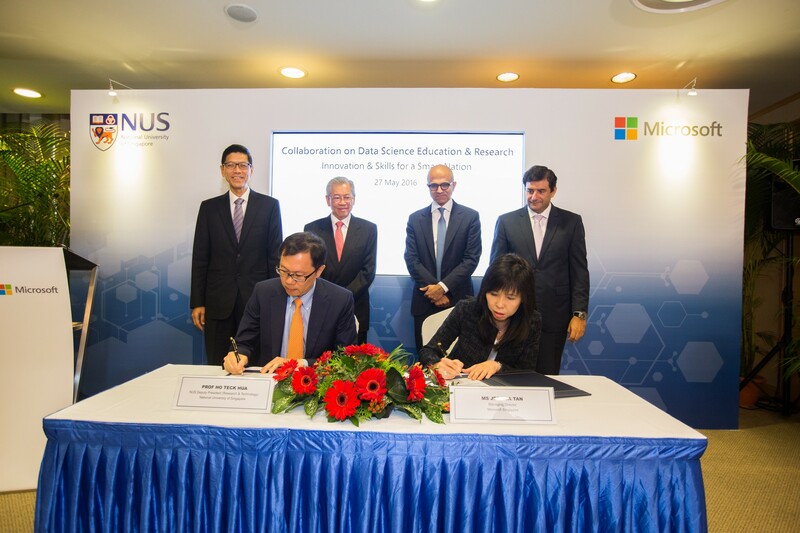 SINGAPORE, 27 May 2016 – The National University of Singapore (NUS) and Microsoft inked a Memorandum of Understanding (MoU) to collaborate on data science education and research. 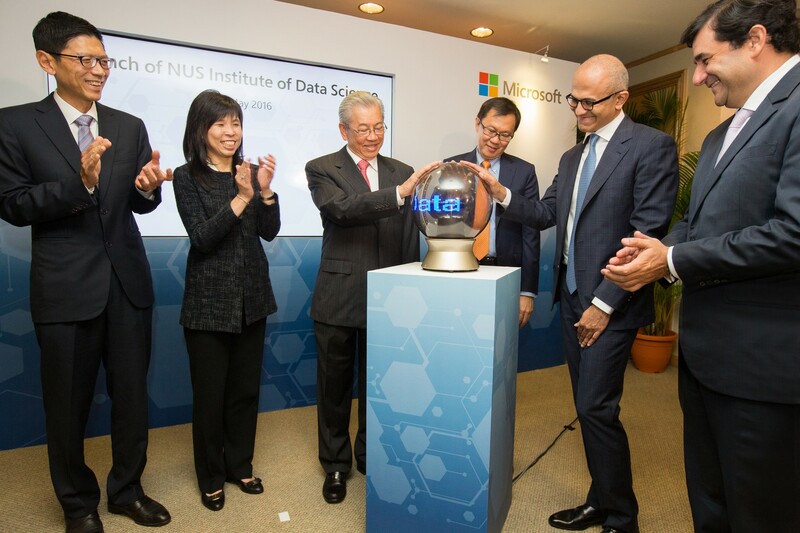 As part of this collaboration, Microsoft also becomes the first industry partner of the newly-launched NUS Institute of Data Science, which will be the focal point for all data science research and translation, education and related activities at NUS. As Singapore continues on the journey to realise its Smart Nation vision, the demand for skilled individuals who understand how technology can be deployed effectively and efficiently to achieve productive and inclusive growth as a nation will only increase. Moreover, with vast amounts of data being collected through the nationwide network of sensors, the ability to make sense of and analyse huge amounts of complex data will enable Singapore to fully harness the power of technology to create solutions that can improve the lives of citizens, and create greater opportunities for businesses. Professor Ho Teck Hua, Deputy President (Research & Technology) of NUS and Jessica Tan, Managing Director of Microsoft Singapore, sign Memorandum of Understanding (MoU) to collaborate on data science and research, witnessed by (from left) Professor Tan Chorh Chuan, President of NUS, Wong Ngit Liong, Chairman of NUS Board of Trustees, Satya Nadella, CEO of Microsoft and Cesar Cernuda, President of Microsoft Asia Pacific. The MoU, which established a private-public collaboration to enable research and tools development for data science, was signed by Professor Ho Teck Hua, Deputy President (Research & Technology) of NUS, and Jessica Tan, Managing Director of Microsoft Singapore. The signing ceremony was also witnessed by Wong Ngit Liong, Chairman of NUS Board of Trustees, Professor Tan Chorh Chuan, President of NUS, Satya Nadella, Chief Executive Officer of Microsoft, and Cesar Cernuda, President of Microsoft Asia Pacific, along with faculty members, students and guests. The collaboration provides a framework for both parties to work collectively on data science research, and translate the research into tools and methodologies that can be used by the industry and academia in Singapore and the Asia Pacific. The framework will also pave the way for both parties to collaborate on capability and talent development in the fields of analytics and research, with the aim of fostering a pool of skilled individuals equipped with a strong understanding of data analytics and data science, to support Singapore’s Smart Nation vision. Consultancy and support directly from technical experts and data scientists from Microsoft. Wong Ngit Liong, Chairman of NUS Board of Trustees and Satya Nadella, CEO of Microsoft, jointly launch the new NUS Institute of Data Science, with Professor Tan Chorh Chuan, President of NUS, Jessica Tan, Managing Director of Microsoft Singapore, Professor Ho Teck Hua, Deputy President (Research & Technology) of NUS and Cesar Cernuda, President of Microsoft Asia Pacific looking on. NUS will also collaborate with Microsoft researchers to work on research areas of mutual interest, such as data science, deep learning and artificial intelligence, and extend co-creation opportunities with Microsoft researchers into building tools for broader use in the Asia Pacific education scenarios. “Data science research, translation and education is an important strategic thrust of NUS. We are very excited to partner Microsoft, a world leader in big data solutions, to expand and deepen our capabilities in this important area. Through the unique curriculum offerings that are designed in collaboration with Microsoft, NUS students can better appreciate the value, opportunities, and insights that big data can provide. Our researchers will also engage in joint research with Microsoft to develop novel, integrated solutions to industry-relevant data science problems, and in turn, harness technology to improve lives of Singaporeans,” said Professor Ho Teck Hua, Deputy President (Research & Technology) of NUS. In addition to grooming more data scientists to support the talent requirements in Singapore, Microsoft will provide its data science curriculum assets, jointly developed by experts from the data science industry, and collaborate with NUS to develop content for the university’s general education curriculum relating to data science. NUS will become the first university in Asia to adopt Microsoft’s data science curriculum, and leverage these assets to train and develop talents in data analytics and data science. Microsoft will also provide internship opportunities for NUS undergraduate and graduate students. “Data is the new electricity powering the digital transformation that all of us are experiencing, whether we are consumers or businesses. It is important that we ready our workforce for tomorrow’s smart economy – one that is increasingly digitised for networked intelligence. I am particularly excited that this collaboration will allow non-IT students, as well as IT students, who will acquire deeper data science and analytics capabilities, to understand how we can harness data and convert it into intelligence, insights, and actions. Even better, it will allow people from a cross-section of disciplines to co-create solutions that will build a Singapore Next that is smarter and more inclusive,” said Jessica Tan, Managing Director of Microsoft Singapore.